I have always been intrigued, fascinated and mystified when it comes to French macarons. I believe I first saw them on Flickr, in an array of colors and flavors. I looked up how to make them myself and was quickly discouraged because they looked so tricky and I was sure I would fail with my own attempt and waste precious ingredients. So instead of making them, I made a Tumblr blog to keep track of my favorite macarons, which is sort of a sister-blog to my Tumblr cupcake blog (tumbler blogs no longer available). Making my own macarons have always been on my to-do list anyhow, because I had never even eaten a macaron. I guess that’s what I get for living in Indiana. Soon after I moved back to Sydney with my family I visited a cupcake shop in Chatswood, Cupcakes On Pitt, and tried two of their macarons, a blueberry one and a chocolate one (my pictures here and here). They were chewier than I had imagined they would be, but they didn’t taste like anything special. I was quite disappointed. Later, however, a friend told me that Cupcakes On Pitt’s macarons were a very poor example as to how macarons should taste. And still I hadn’t made my own macarons. I was just dying to, but was still too frightened. A couple of weeks ago, Samantha of Sweet Remedy mentioned on Twitter that she was scared of making macarons as well. I had earlier befriended Samantha when we were in a throwdown for October 2009’s Cupcake Hero competition. So I casually mentioned to her that I was scared as well, and from this we decided to have our own macaron challenge; we would make them “together”. Well, as “together” as we could anyway, with Samantha being on the other side of the world from me! 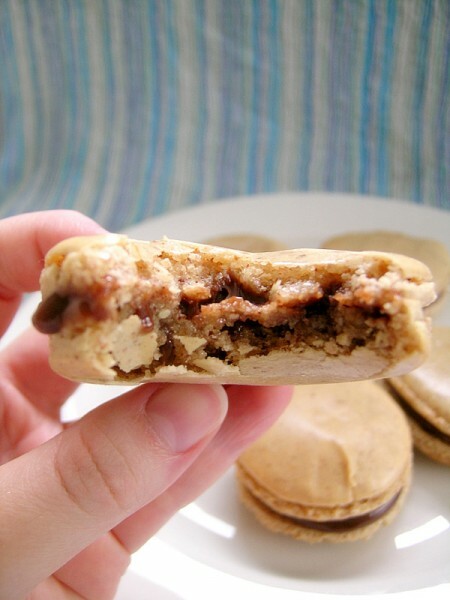 We decided on making coffee macarons with a Nutella ganache filling. I used the coffee macaron recipe from My Tartelette, and the Nutella ganache filling from Italian Food Forever. 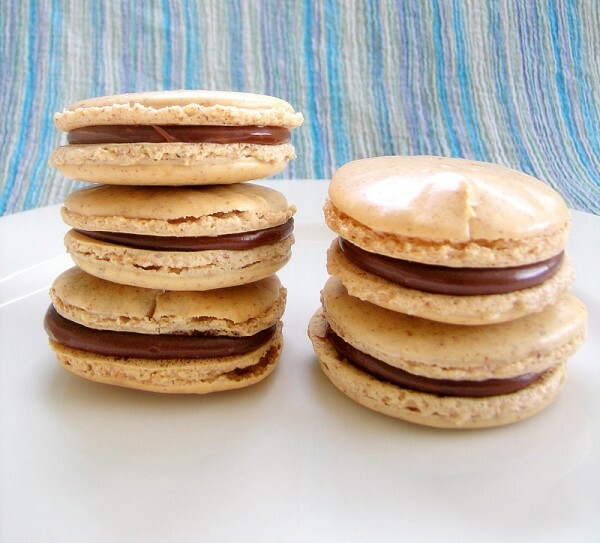 Samantha appears to have used both the coffee macaron recipe and Nutella ganache filling recipe from Italian Food Forever, but both coffee macaron recipes are basically the same, except one has more coffee powder than the other. 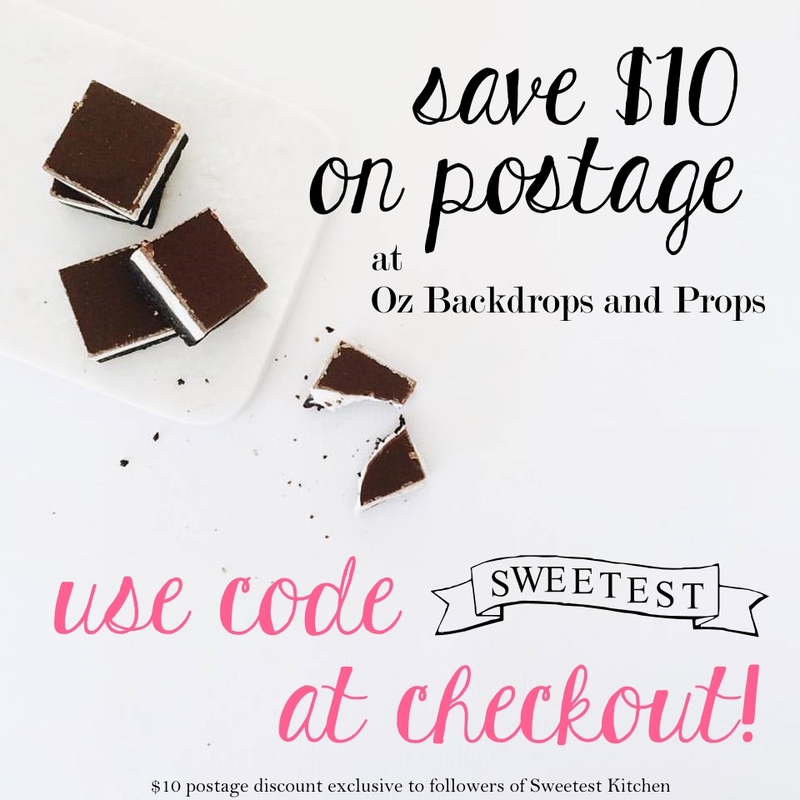 I didn’t do step-by-step photos, I’m not that kind of person and I’ve never done step-by-photos, but Samantha did and you can find that on her post about her macarons. She did a wonderful job; although not all of hers turned out perfectly, she got a few very beautiful-looking macarons! I didn’t think that making the batter was as hard as I had thought it would be. I should note that my only substitution was that I couldn’t find espresso powder, so I finely ground some instant coffee granules into a powder instead. I aged my egg whites in the refrigerator for 3 days and let them warm up to room temperature before whipping them. I then followed My Tartelette’s directions on mixing the almond mixture into the egg whites, and was super careful not to overmix it. I drew circles on the bottom of my parchment paper that were 1.5 inches in diameter and piped the batter into the shape of the circle. I let them sit out for 60 minutes before placing them in the oven. Samantha had told me that when I felt the macarons with my finger, none of the batter should stick to my finger, so I waited for that happen, which was 60 minutes. I set the oven for 300F for 12 minutes. After 4 minutes, feet started appearing! I was so happy that I gave my two young children a multitude of hi-5s! However, a few minutes later the tops of the shells started cracking. I wonder if either I left the macarons sit too long, or if the oven was too hot. The other thing I noticed was that at first the feet rose quite high, but by the end of their time in the oven, they seemed to sort of collapse. I don’t know what was going on there. I ended up leaving them in for 15 minutes. When I took them out they were light in color, but after cooling, they seemed to get a little darker. My macarons came off the parchment paper quite easily, but Samantha’s didn’t. I noticed that some of my shells had an air pocket inside, as did Samantha’s and we’re not sure why this happened. Taking a tip from Samantha, I refrigerated the shells for a while before filling them so that they would firm up a bit and not be quite so fragile to crack. I piped on my filling to make sure the edges of the filling would look nice. In the end, this is how they looked. Although not anywhere near as perfect as you could find at My Tartelette, I think I did pretty well for my first go and am not disappointed. They taste amazingly great too! They were still surprisingly chewy, but I was very happy to find that they tasted much better than the macarons I had first had at Cupcakes On Pitt. Now that I have finally tried making these, I have been encouraged to try again and again, and with different flavors. I love matcha, so you can bet that you’ll eventually see a matcha-themed macaron appearing here soon. Thanks for doing this with me, Samantha! They look so nice!!! You did a great job! I wasn’t sure which recipe we were using for the coffee part but they were virtually the same! But maybe that is why mine are speckled with coffee? and piping the filling! I’m so glad you did that so now next time I make them I can do the same! they look so much better with the filling pipped on. I only left mine to sit for 30 minutes. maybe thats why most of mine had air pockets? I still haven’t found any answers to that.. 🙁 or maybe thats why mine stuck to the baking sheet..? oh sigh. So glad we did this! I was thinking about making matcha ones too!! About yours being speckled with coffee, you used the instant coffee granules? Did they get finely ground down? I thought they might not, so I ground mine separately to make it a powder before adding it to the almonds and powdered sugar. But maybe if I had used an extra teaspoon of coffee like the Italian Food Forever’s recipe, I might have gotten that! I can’t tell on the photos from that recipe if those macarons have speckles of coffee or not, it looks like something may have been used to dust the tops, coffee powder? cocoa? Yes, I’d definitely recommend piping the filling on! I still have no idea about the air pockets! Good for you! I see macarons all over the web but I’m always too intimidated to try them myself. I think your flavor combination is awesome!